A large proportion of the grapes for this wine come from the original 1963 plantings of cabernet sauvignon, merlot and cabernet franc vines. The remainder is from the more recently planted – 1989 – petit verdot. Whilst the proportions are different every year, depending on fruit set and cropping levels, roughly speaking the break down is about as follows: 65% cabernet sauvignon, 30% cabernet franc and merlot, and 5% petit verdot. The addition of the petit verdot grapes in the 1990s gave the wine an added backbone of tannin and natural acidity. With its long growing season, the petit verdot grapes are the last to be harvested, usually in mid April. The vines for the Amelia are all dry farmed – that is, there is no irrigation. The roots go deep into the clay soil, searching out any available moisture. This and the age of the vines is crucial to making the intense yet elegant wine. 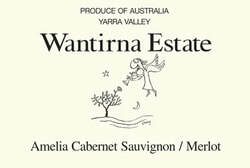 The wine is approachable young but will age for more than fifteen years.